10. Indian Ordnance Factories Health Services (IOFHS) The approval of Secretary (Exp) has been obtained. Note for CRC has been sent to Cabinet Secretariat on 25.09.2018. Meeting of CRC was held on 15.10.2018. Necessary consultation as per directions of CRC are being taken. 11. 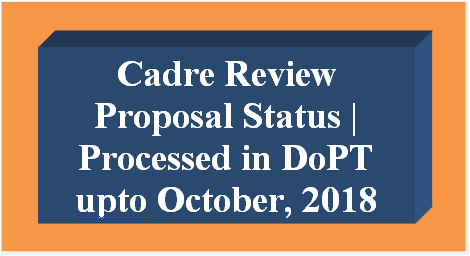 Survey of India Group 'A' The cadre review proposal has been received in DoPT which is under consideration. 12. Indian Economic Service DEA has been requested for certain clarifications which have been received and are under consideration. 16. Indian Armament Naval Service (INAS) DoE has sought certain clarifications. Reply of MoD has been received which has been sent to DoE on 04.09.2018 . 17. Indo Tibetan Border Police (ITBP) Recommendations of DoPT have been sent to DoE for approval of Secretary (Exp) on 24.08 .2018 .